Sinking tectonic plates get jammed in a newly discovered layer of the Earth’s mantle – and could be causing earthquakes on the surface. It was previously thought that Earth’s lower mantle, which begins at a depth of around 700 km and forms the major part of the mantle, is fairly uniform and varies only gradually as it goes deeper. However, our new study points towards a layer in the mantle characterised by a strong increase in viscosity – a finding which has strong implications for our understanding of what’s going on deep down below our feet. 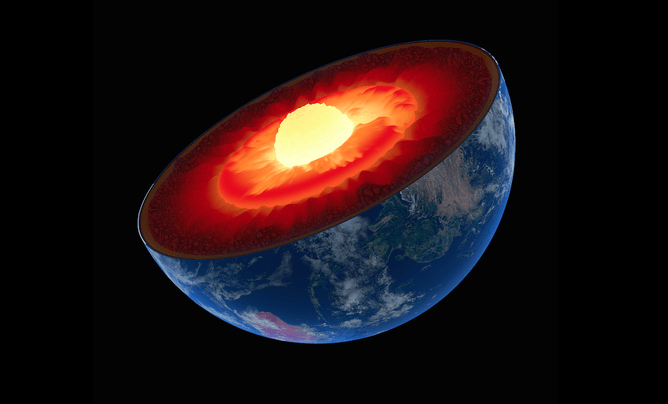 The Earth’s mantle is the largest shell inside our planet. Ranging from about 50 km to 3000 km depth, it links the hot liquid outer core – with temperatures higher than 5,000K – to the Earth’s surface. The movement of materials within the Earth’s mantle is thought to drive plate tectonic movements on the surface, ultimately leading to earthquakes and volcanoes. The mantle is also the Earth’s largest reservoir for many elements stored in mantle minerals. Throughout Earth’s history, substantial amounts of material have been exchanged between the deep mantle and the surface and atmosphere, affecting both the life and climate above ground. Because mankind is incapable of directly probing the lower mantle – the deepest man-made hole is only around 12 km deep – many details of the global material recycling process are poorly understood. We do know, however, that the main way materials are transferred from the Earth’s surface and atmosphere back into the deep mantle occurs when one tectonic plate slides under another and is pushed down below another into the mantle. So far most researchers assumed that these sinking plates either stall at the boundary between the upper and lower mantle at a depth of around 700 km or sink all the way through the lower mantle to the core-mantle boundary 3,000 km down. But our new research, published in the latest online issue of Nature Geoscience, shows that many of these sinking slabs may in fact be trapped above a previously undiscovered impermeable layer of rock within the lower mantle. We found that enormous pressures in the lower mantle, which range from 25 GPa (gigapascal) to 135 GPa, can lead to surprising behaviour of matter. To picture just how high this pressure is, balancing the Eiffel Tower in your hand would create pressures on the order of 10 GPa. These pressures lead to the formation of a stiff layer in the Earth’s mantle. Sinking plates may become trapped on top of this layer, which reaches its maximum stiffness at a depth below 1,500km. We formed this conclusion after performing laboratory experiments on ferropericlase, a magnesium/iron oxide that is thought to be one of the main constituents of the Earth’s lower mantle. We compressed the ferropericlase to pressures of almost 100 GPa in a diamond-anvil cell, a high-pressure device which compresses a tiny sample the size of a human hair between the tips of two minuscule brilliant-cut diamonds. A diamond-anvil cell compresses a tiny sample under high pressure between two minuscule diamonds. While under compression, the ferropericlase was probed with high-energy x-rays to investigate how it deforms under these high pressures. We found that the ability of the material to resist irreversible deformation increased by over three times under high pressures. These results were used to model the change of viscosity with depth in Earth’s lower mantle. 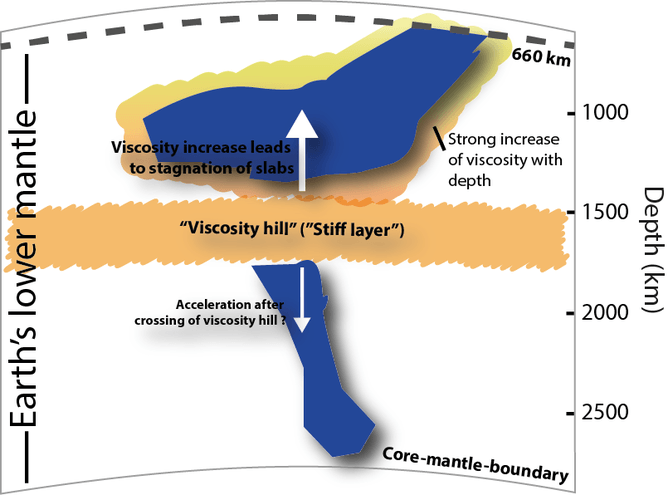 While previous estimates have indicated only gradual variations of viscosity with depth, we found a dramatic increase of viscosity throughout the upper 900 km of the lower mantle. Such a strong increase in viscosity can stop the descent of slabs and, in doing so, strongly affect the deep Earth material cycle. These new findings are supported by 3-D imaging observations based on the analysis of seismic wave speeds travelling through the Earth that also indicate that the slabs stop sinking before they reach a depth of 1500 km. If true, the existence of this stiff layer in the Earth’s mantle has wide-ranging implications for our understanding of the deep Earth material cycle. It could limit material mixing between the upper and lower parts of the lower mantle, meaning mantle regions with previously different geochemical signatures stay isolated in separate patches instead of mixing over geologic time. What’s more, a stiff mid-mantle layer could also put stress on slabs much closer to the Earth’s surface, potentially acting as a trigger of deep earthquakes. We are really just at the beginning of a deeper understanding of the inner workings of our planet, many of which ultimately affect our life on its surface.